The Biennale is anything but free of the powers that govern world affairs. Most of the artists represented are sponsored by national governments, or arts organizations supported by those governments. The Biennale features government pavilions dedicated to promoting nationalism. Credit for the work in these pavilions is given to the “Commissioners”, with the artist gaining last-place credit. In some cases, the artist has no association with the country except as the recipient of sponsorship. In others, the artist was born in the sponsoring nation, but no longer lives there. When the artist is sponsored by their adopted country, that country’s promoted image is as a “nation of Immigrants”. Christine Macel has been director of the Centre Pompadou, and her resume reads like someone who is totally a part of the government system. The organization is controlled by government surrogates who select the work and how it is shown. It is not controlled by artists. 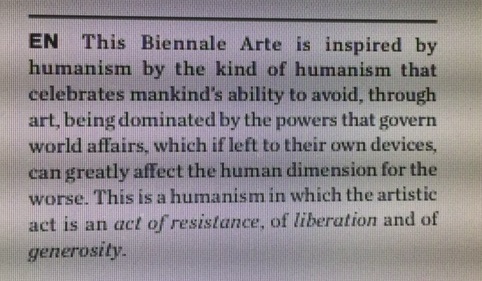 The Biennale is totally about art dominated, sponsored and selected by “the powers that govern world affairs”, or their surrogates. Within this constraint, it is amazing that the art (on the whole) is of quality. It’s always interesting when things in life reoccur. They happen again but are always different because other things happen between the original occurrence and the reoccurrence. As T. S. Eliot writes “to arrive where we started and know the place for the first time”. Four years ago, I went to Venice to see the Biennale. Actually, I went to Ravenna to see the mosaics, and who in their right mind being in Ravenna would not also go to Venice. Because, after all, Venice is Venice. 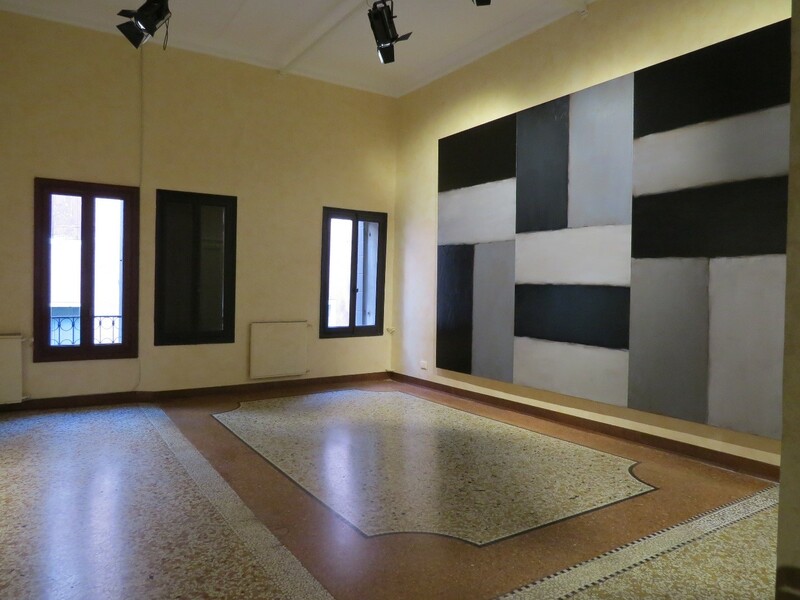 While in Venice, I took the opportunity to see the Biennale and Pollock’s painting ‘Mural’. I wrote some time ago that it was a weird experience being in Venice to see Mural when it was from Iowa, and I had been in Iowa without knowing that the painting was there and I could have seen it there and then. Mural is now on show at the National Gallery of Art in Washington DC where I live. Seeing it last weekend was definitely déjà vu. What was even more exciting was that my wife was as excited by seeing the painting as I. She wants to go back for a second look this weekend. She is not a major Pollock fan of the less interesting splash-dash paintings which are always pushed on the public. The abstract works that are precursors and post cursors to the splash paintings are really more exciting. Abstract is always abstract, but semi-abstract has the possibilities of multiple interpretations and a sense of discovery; they offer a narrative adventure. Seeing Mural was déjà vu, but not the same experience. 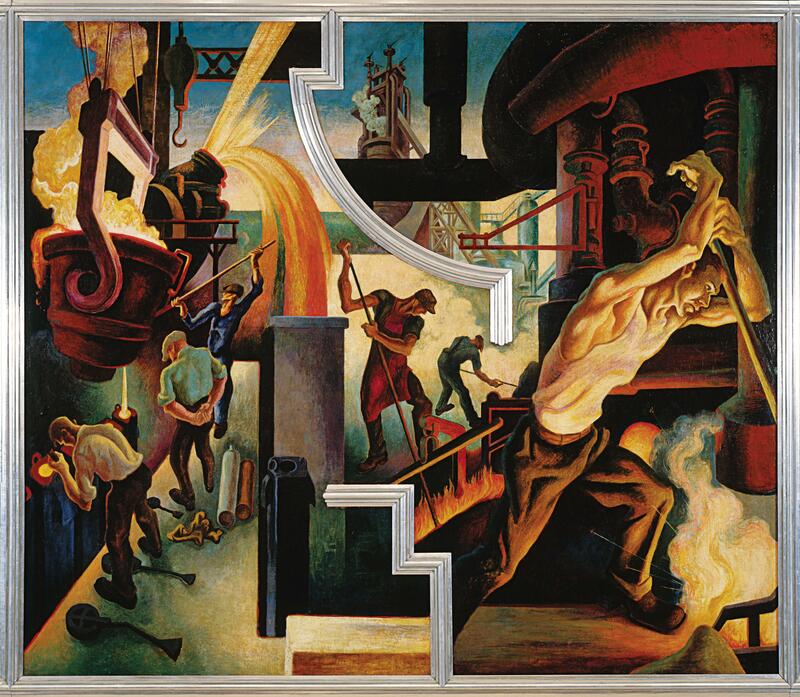 Since Venice, I have seen Thomas Hart Benton’s painting series “America Today” series at the Metropolitan Museum in New York. Benton was the teacher of Pollock and their roots are in the works of Tintoretto (whose works I saw in Venice). 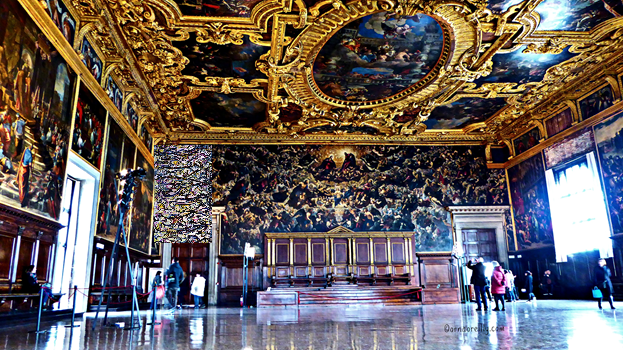 I have also written about Tintoretto and looked at every work available in Venice. And the National Gallery also has several Tintoretto’s. I previously wrote about the Nutshell Studies for Unexplained Death. I saw this in Baltimore at the Maryland Office of the Chief Medical Examiner. This is now at the Renwick Gallery. I visited the exhibition on the first day. The gallery was packed. It is always staggering how many people share your interest in something that you would consider to be obscure and a niche interest. When I wrote about the nutshell studies, I compared these with Vermeer. I also saw the Vermeer show at the Met. A Vermeer show opened last weekend at the National Gallery of Art. I still have to see it. The weekend that I saw ‘Mosaic”, there was a massive queue for the show. Déjà vu on Pollock, déjà vu on Nutshell studies and déjà vu again on Vermeer. I look forward to seeing both shows: the Nutshell studies (less crowded) and the Vermeer for the first time. And to revisiting Mural yet again, again and again. This time instead of me having to travel to get to them, they have all traveled to get to me. It’s like a return visit from a friend, or group of friends. Jackson Pollock was the model for the main figure. 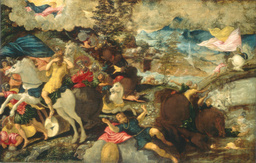 Jacopo Tintoretto (Italian, 1518 – 1594 ), The Conversion of Saint Paul, c. 1545, oil on canvas, Samuel H. Kress Collection. National Gallery of Art, Washington, D.C. So for the last week my wife, Theresa mARTin, and I have been showing at Glenview Mansion Art Gallery in Rockville, MD. Showing is a totally different experience to viewing, but I think both are essential for an artist. I have not done much writing for this blog since I returned from Italy last year; all the minutia of life impinges on one’s best plans. Also, my wife, Theresa mARTin, and I have been working towards a show at Glenview Mansion Arts Gallery in Rockville (November 6 -23, 2016). (http://www.rockvillemd.gov/index.aspx?NID=607) The show represents two years of making art; two years of our creative output. Two years of our lives. We now enter the period of the “other non-art stuff”: naming the pieces (or trying to remember what they were called), organizing how to display them, truck rental, updating resumes, writing about the pieces, printing postcards, and pricing pieces. All of that stuff that is not making art. All of those non-art chores that all artists must do. Luckily, we get to share these chores: my wife does a lot of her advertising for the show and therefore can do mine at the same time. The tradeoff is a house full of pre-show anxiety / neurosis. In any endeavor, you have that which is essential is to perfect your art and that which is needed to promote yourself or make your work real and reach a larger audience; the process of making public what is basically a private. Ultimately, the no-art work impinges on the ability to make the work. A good friend of mine who is a jazz musician said that in Jazz, there is a common problem. There are those who promote themselves well, and those who are really great musicians and are worth listening to. However, because time is finite, the two rarely coincide. You either have time for your craft, or time to promote it. You rarely have both. What makes it even harder is that the promotion of your art really needs to be an on-going and continual process, as opposed to a pre-show flurry that a lot of us do. It really needs two people to do all of this. A lot of artists work as couples and roles are divided. It is not unusual for the husband to produce the art and the wife to promote the career. In other cases, one partner earns the income to pay for the time and materials for themselves and their partner. Someone once told me that I had a patron and it was me because I was lucky to earn well (in a prior economy). So, there is often a scenario where one half of the couple becomes the provider and the other the producer. Luckily, in our relationship, we both create. I provide the bulk of income, Theresa provides some income and gets to produce. I still get to produce a lot and am lucky because my art takes more mental work that physical work. However, the grind of my day job occasionally impacts my ability to produce art. This is most impacted at times of high creative productivity and at times of stress at work; the high and low points of any job. We all make tradeoffs. So, now I move into the non-art time before the show. Photos to take, website to do, sculptures to name (or rename, since I have totally forgot the working titles of some pieces). I am tempted to just name them sculpture 1, sculpture 2, sculpture 3 etc., but I also forget the order in which they were done. And some pieces were started before yet finished after other pieces. Some sculptors even name their sculptors after the color of the piece. I will call one piece “Yellow Terror” because it was a nightmare to make. Some such as “Red Summer” were instantly visualized in their final form. Some were easy. Some just struggled to an end. Some evolved as I worked on them. There was no single process from start to end. 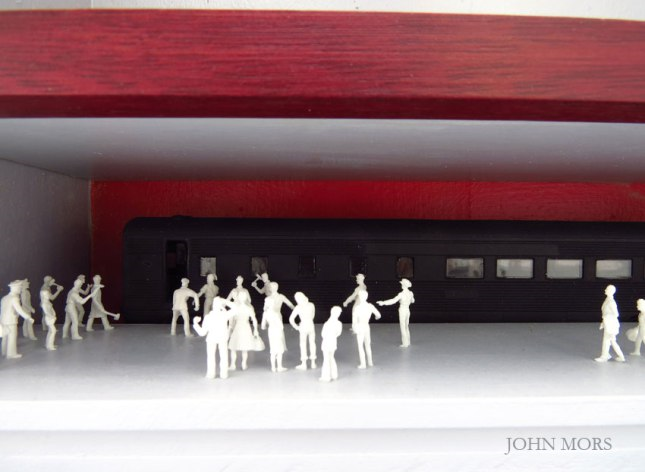 So, now is the time to put down my sculpture tools and pull out the tools of otherness. Showing is the only way you ever really get to see your work as an ensemble and out of the protection of the studio. It is when you really get to evaluate what you have done. It’s a bit like sending a child out into the world. If you taught them well, they will survive. If your art is good, it should show well. Most people keep their inner demons to themselves. Artists do it in public. It is extremely difficult to navigate the Biennale in any cohesive manner, and although the catalog is organized into three different sections, it fails to explain the rationale. There is an assumption that the visitor will either be happily led or know the structure implicitly. 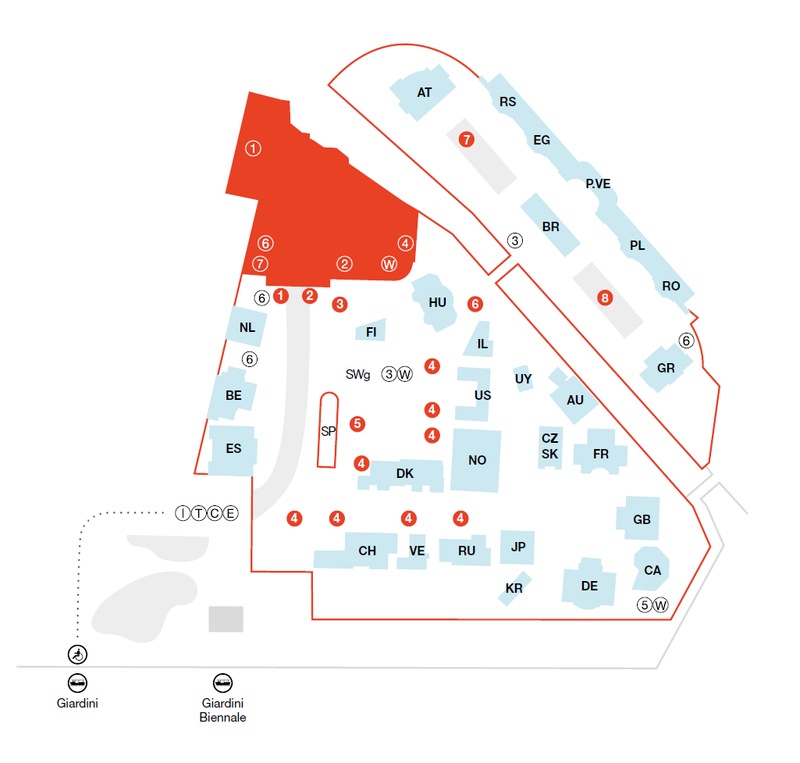 The Biennale actually has two concurrent disparate exhibition types, curated exhibition and National pavilions, split across two disparate locations, the Giardini and the Arsenale. It also consists of loosely associated works at multiple remote venues; these are called collateral events. The first component of the Biennale is a curated exhibition in the Central Pavilion based on the idea of all the worlds’ futures. This includes art by both living and dead artists. At the Giardini, this is indeed the hardest portion of the Biennale to navigate. The guide to the show is organized by room (there is no cross reference by artist), and the actual room flow is like a labyrinth and is very hard to navigate. 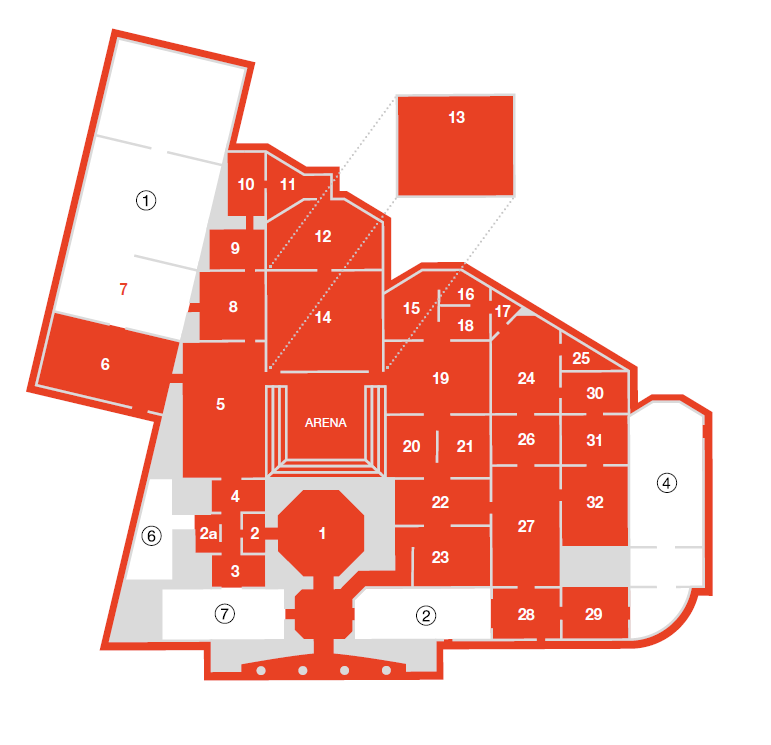 Although the guide lists the exhibition by room number, room numbers are displayed nowhere. To determine which room you are in, you locate the name of the artist of a work in the room. You then look up the guide to determine which room that artist is in. This would identify the room except that some artists are shown in several rooms. The apparently random placement of artists in several rooms leads to a total lack of cohesion. At times, it was difficult to determine how some of the artists related to the theme, and why they are grouped together. The most satisfying rooms tended to be those dedicated to a single artist as opposed to several artists. However when this work spans a long period of time, the effect of the work can be diluted, as in the room containing the work of Hans Haacke. At the Giardini, several individual works were of note. 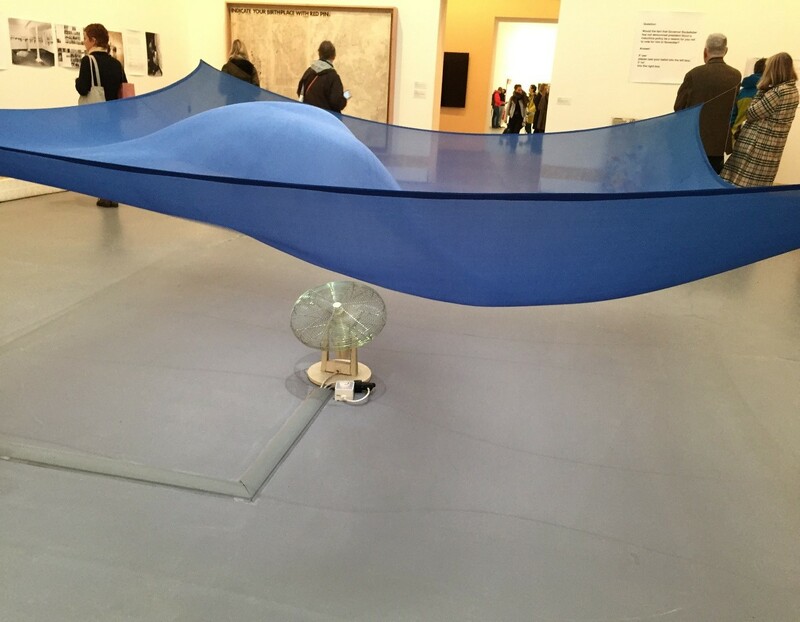 Hans Haacke’s fabric activated by a fan was beautiful for its simplicity. In the adjacent room was the work of Charles Gaines. 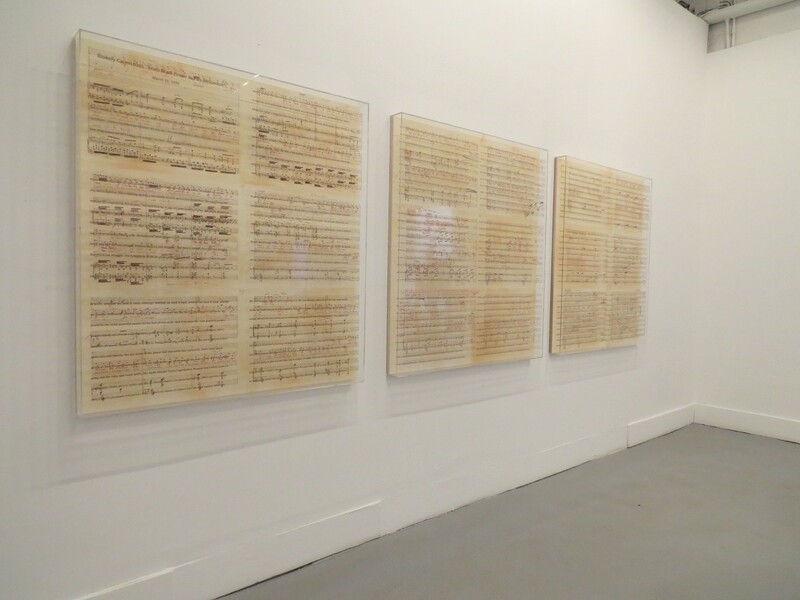 This has panels of writing overlaid on images of musical notation. This created beautiful parallel images that for me represented the historical argument about whether religious music was first and foremost about the words or about the melody. It also reminded me of how when we listen to any piece of music, our mind oscillates between focus on the words or on the music. The curated section at the Arsenale was easier to navigate because the flow of rooms was linear. However, there were several artists whose work I specifically wanted to see, but gave up in frustration. The next type of exhibition was the individual national pavilions. Again navigation at the Giardini was extremely difficult as there was no logic in the placement of the pavilions. The area adjacent to the Australian Pavilion was endemic of this. Navigating in the rain was unpleasant since few architects seemed to accommodate where visitors would stand while waiting to enter their pavilion, for example the Uruguay pavilion restricted the number of visitors who could be in the building but provided no waiting area. 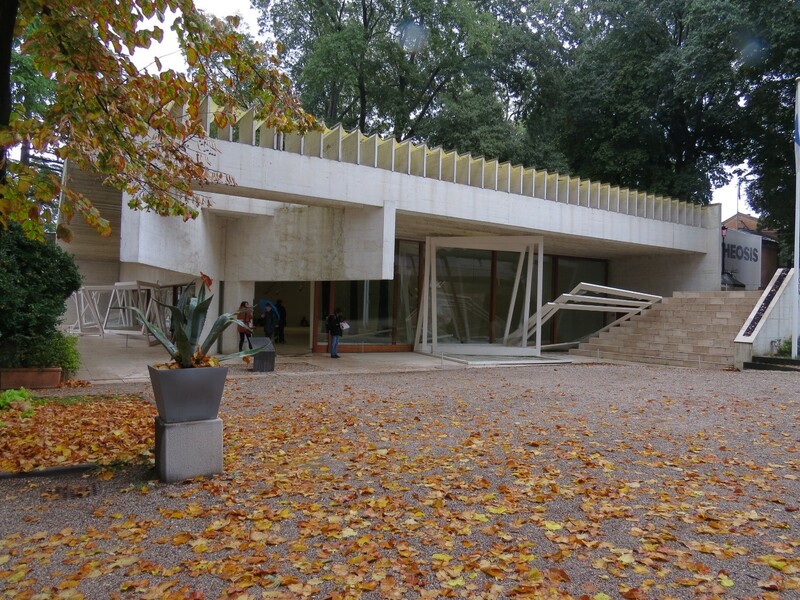 The work in some pavilions at the Giardini was outstanding, such as the Japanese pavilion and the elegant simplicity of the Austrian Pavilion (AT), where the work of Heimo Zobernig was in perfect harmony with the 1934 pavilion of Josef Hoffman. The work of Chiharu Shiota in the Japanese pavilion (JP) was that rare type of work that resonates with both an art and a non-art audience. 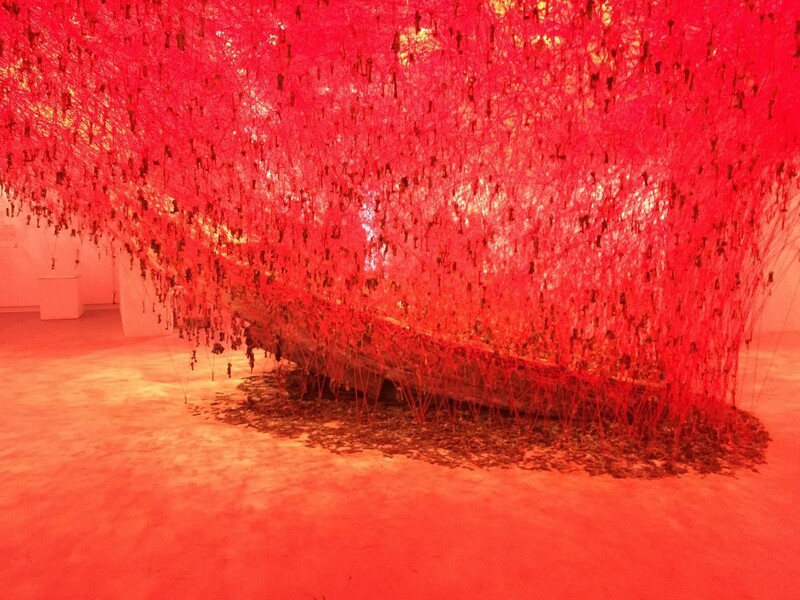 The room was filled with ribbons with keys attached suspended from the ceiling and surrounding two boats. This created beautifully illuminated passages through which the visitor could pass. Adjacent to the Japanese pavilion was the Norwegian pavilion. This held the work of Camille Norment. As you moved around the exhibition, you were surrounded by sound that reflected your motion. This was a pleasant surprise. The only reason that I went into the pavilion was to get out of the rain. It was a rare pavilion in that it welcomingly opened to the exterior instead of having a door that defined territory. The Austrian pavilion was a breath of fresh air. Amongst all of the complex structures, this pavilion was a relief. People would just sit in it and relax. In 1936, Joseph Hoffman designed a beautifully simple pavilion. 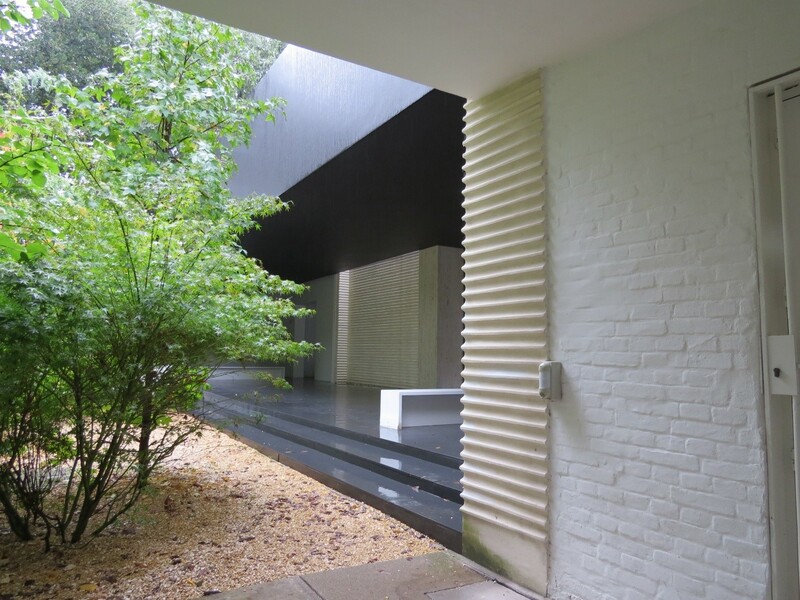 In sympathy to this structure, Heimo Zobernig placed minimalist benches where the visitor could sit to enjoy the structure. As well as providing a place to sit, the work actually enhanced the lines of the structure. The artist’s humble response was respectful to the work and showed a modesty absent elsewhere in the Biennale. This was the rare case of an artist playing simple homage to the containing structure; How noble to create a work of art that exists solely to highlight another work of art. 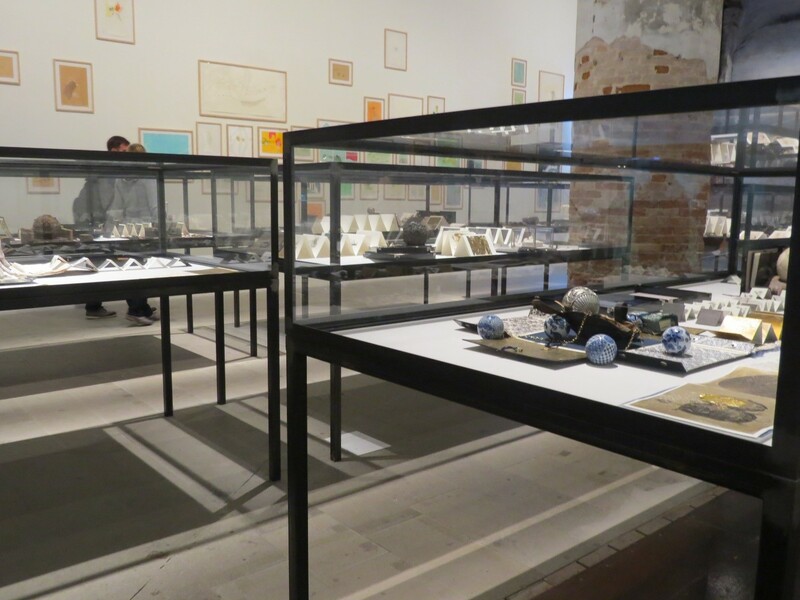 The second venue, the Arsenale, also contained curated works and National Pavilions, the only apparent difference being that the Arsenale buildings were all repurposed older buildings of the Venice Arsanale, as opposed to later constructions. 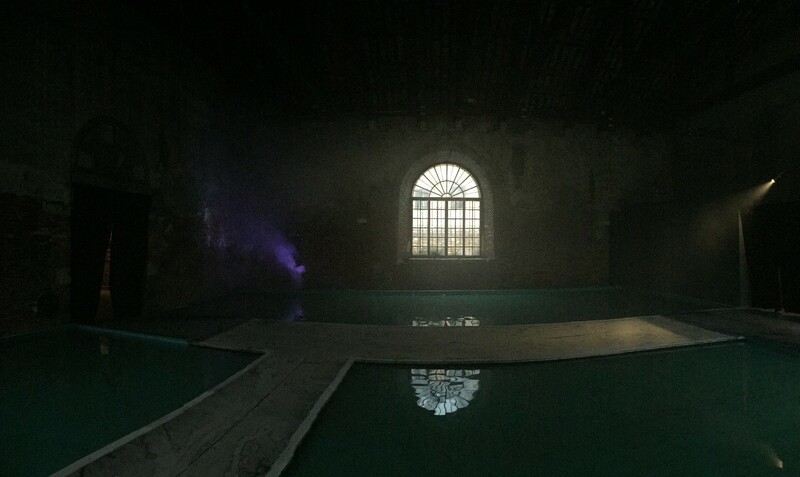 At the Arsenale venue, the connection between the pavilions was linear. The curated works were at the start of the line, and led well into the national pavilions. 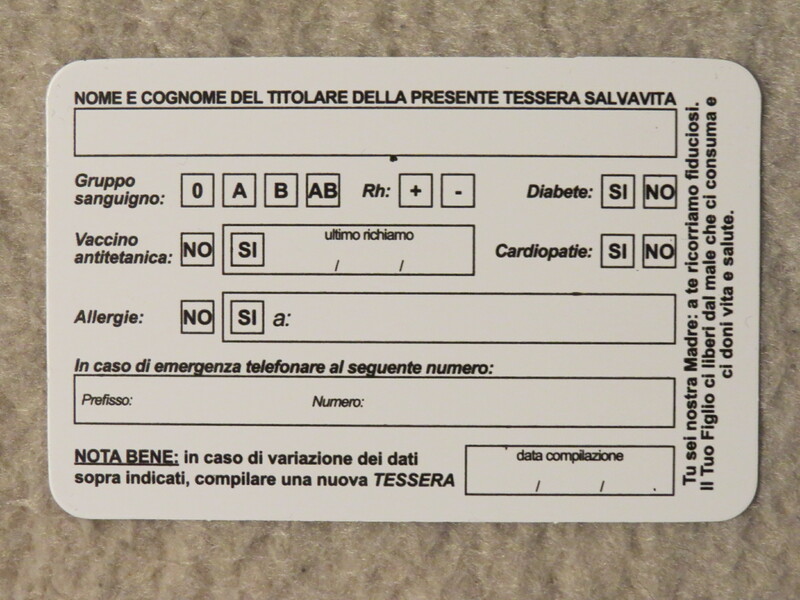 This made navigation a lot simpler, although again there was no indication of room numbers. 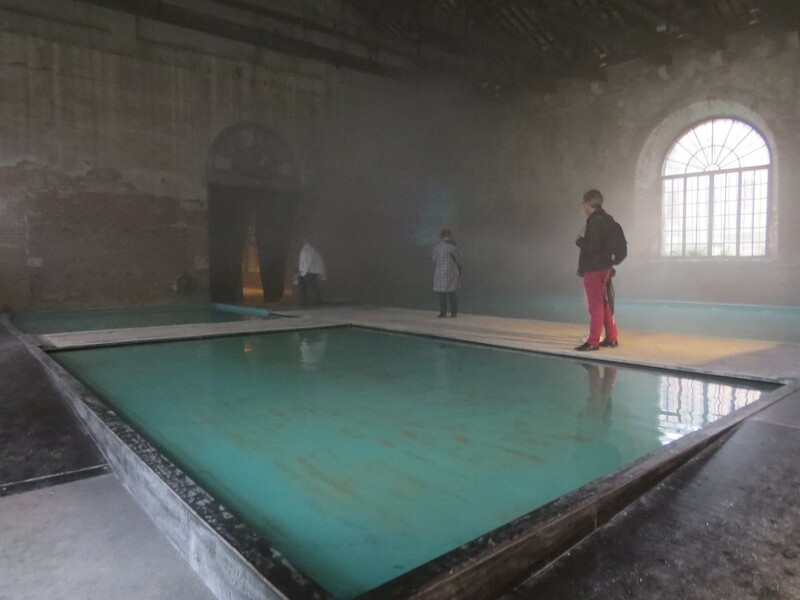 Although the curated section at the Arsenale was easier to navigate because the flow of rooms was linear, the invited section consisted of three parallel corridors which at time made orientation difficult. This led to major congestion at the doors as people tried to reorient. Again, there were several artists whose work I specifically wanted to see, but found myself walking in circles trying to find them. The later Italian pavilion had a dual corridor structure which worked a lot easier, as there was only one possible path around the pavilion. As at the Giardini, there would be rooms that were a mix of artists, rooms dedicated to a single artists and rooms with a combination of both. Although a considerable amount of work by Roberto Bray was in one room, mixing it with the work of others made the work suffer. It created an incomplete experience. The Tuvalu (TV) pavilion stood out as a really thoughtful presentation of the perils faced by the island of Tuvalu as a result of global warming. You walked on boards across a set of shallow ponds while the air was filled with mist and a video was unobtrusively projected onto part of the wall. 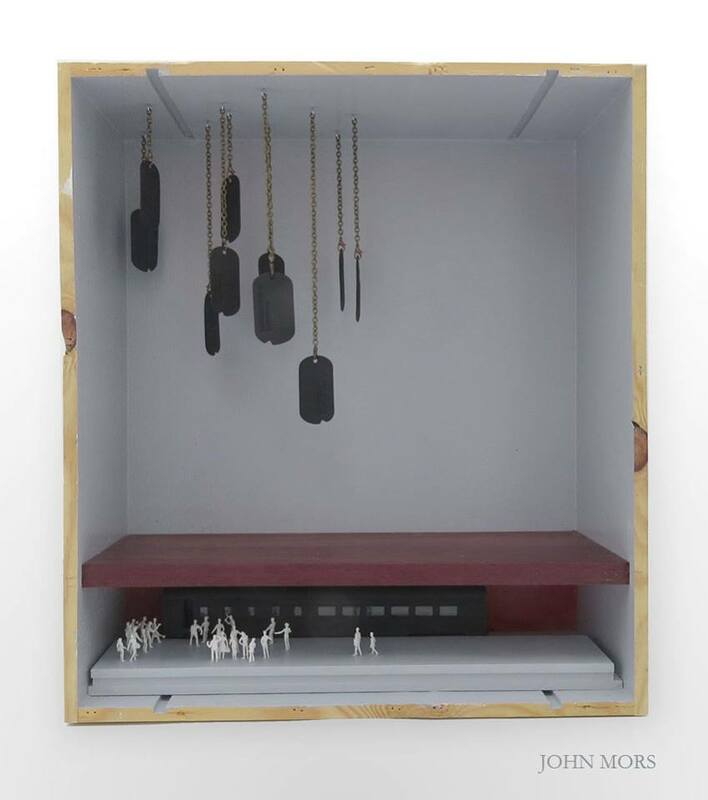 It was a case where the installation worked as both a political message and as a work of art. Interestingly, the day after I visited the Biennale, San Marco Piazza flooded. An interesting case of reality mirroring art, or is it of art mirroring reality. Like several pavilions, the Tuvalu Pavilion demonstrated the international nature of the art world. Although the pavilion represented the island of Tuvalu, the artist Vincent Huang is Taiwanese. The Japanese star of the Biennale, Chiharu Shiota resides in Germany. This dilemma was highlighted by the decisions of Kenya and Costa Rica to withdraw from the Biennale when they realized that the majority of the artists represented in their pavilions were Chinese and not natives of the country they were representing. The use of a non-Tuvalu native for their pavilion does not concern me, since he has worked extensively in that country and his work is very focused on that nation’s problems. The works in the Italian pavilion were amazing, being modern and yet relevant to the present. The Italian Pavilion (IT) had a cohesion and quality not present in the overall Biennale. 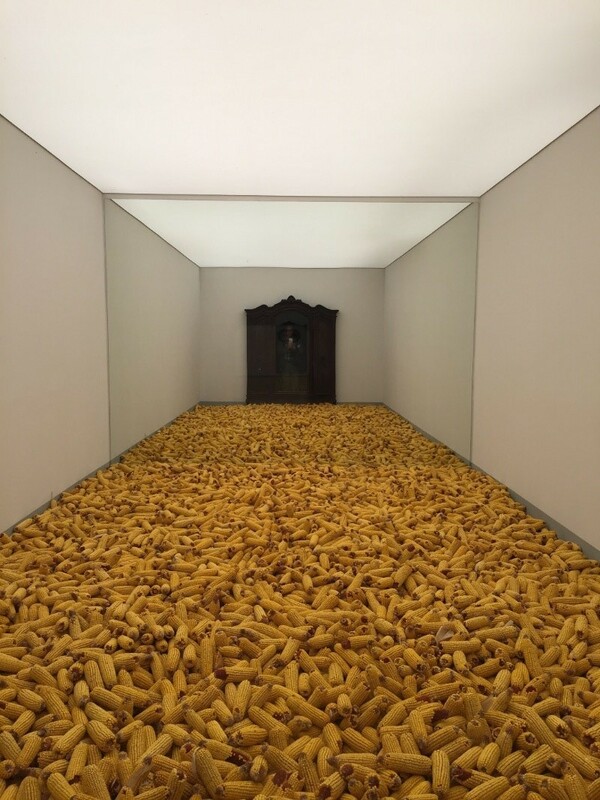 The corn room of Marzio Migliori had a steady queue waiting to look into the room. By placing a mirror at the end of the room, the viewer was pulled into the still life. Interestingly, it was only when reviewing the photograph that I realized that there was a mirror in the room. I had assumed that the only mirror was in the cupboard at the end of the room. The experience of the room was so powerful that it overcame any desire for an explanation. 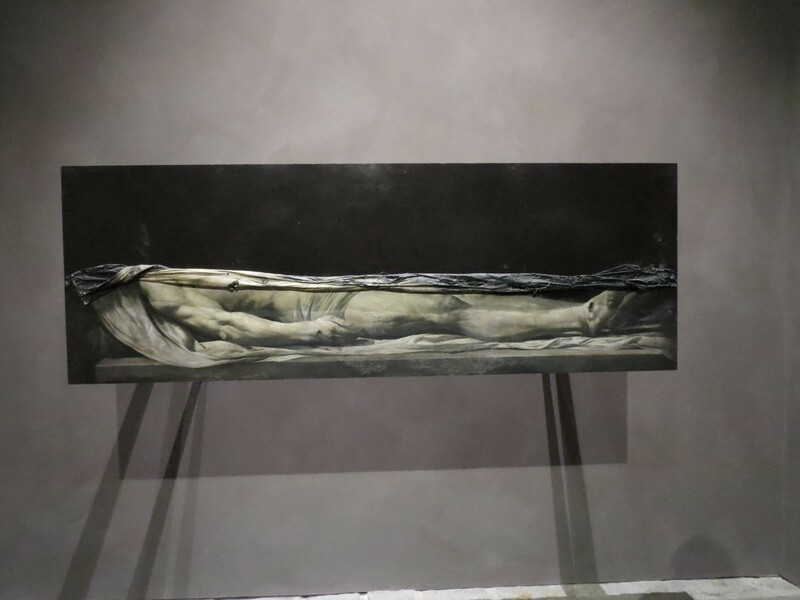 The chapel of Nicola Samori was emotionally powerful being familiar and yet unnerving. The last type of Biennale exhibition was termed collateral events which were scattered throughout the city. These were exhibitions that were under the banner of the Biennale, but not part of the core. 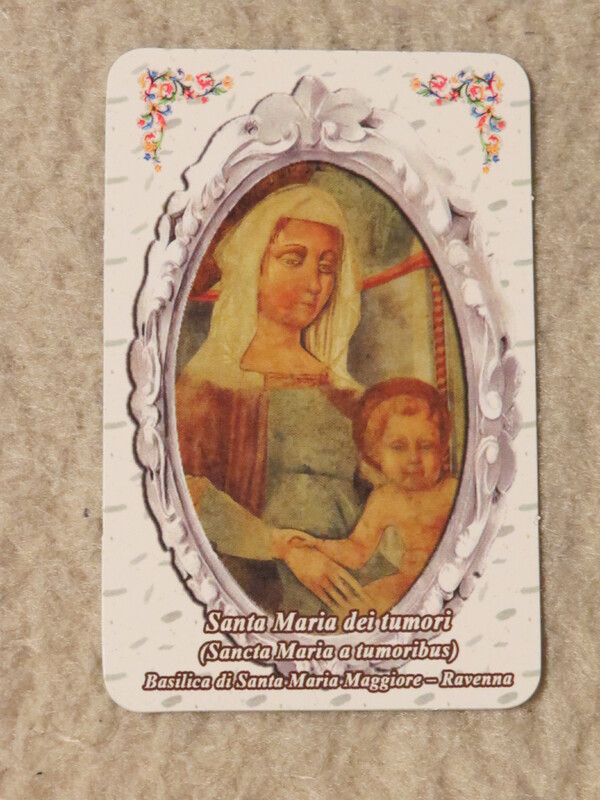 The major problem was that these could be extremely difficult to find, sort of like a poor unwanted relative. I saw both the inane and the brilliant in the collateral events. The Sean Scully show was brilliant, not just for the work, but for the way that the work resonated with the building in which it was shown. I easily found the Sean Scully show the first time, but I had major difficulty the second time. This was because there was a sign pointing to it from an easy navigable point, but nothing indicating in which of several alleys the work was located. To locate the work, you had to return to the original sign to obtain the address. Anyone who has been to Venice, understands the labyrinth that is the Venetian street structure. This was the major reason why I saw only a fraction of the collateral events that I had intended to see. The distance between collateral shows and the difficulty of navigating to them, made the effort of finding the exhibitions exceed the potential value of the exhibition. New Zealand even had an event at Marco Polo airport which is difficult and expensive to reach, and because of plane schedules, most passengers were there when the exhibition was closed. 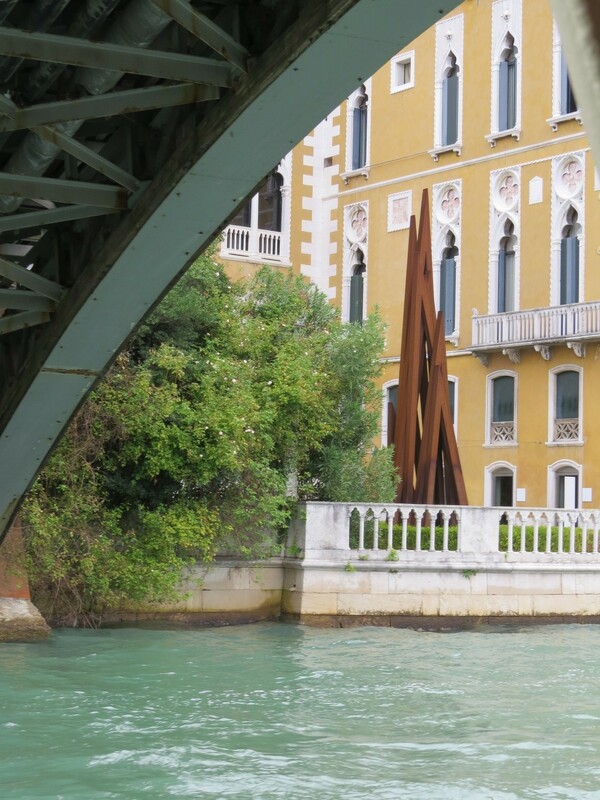 Because the Biennale is at two major locations, The Giardini and the Arsenale, you have to travel from one to the other to see all of the work. And yes, I got lost yet again. There were instructions for going from the Arsenale to the Giardini, but there were none for going the opposite way. The map hinted that you could access it from Arsenale north boat stop, but this required walking through a restricted area. The reason for my confusion was that the boat I caught took me went directly to the Giardini stop without passing the Arsenal stop. Therefore, all I saw on the map was the incorrect Arsenale stop. 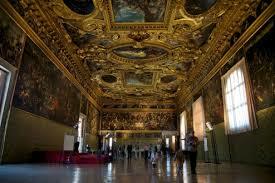 I should state that, before leaving for Venice, I researched the contents in the catalog and Web site. There were specific works that I intended to see and I had marked these on a map. 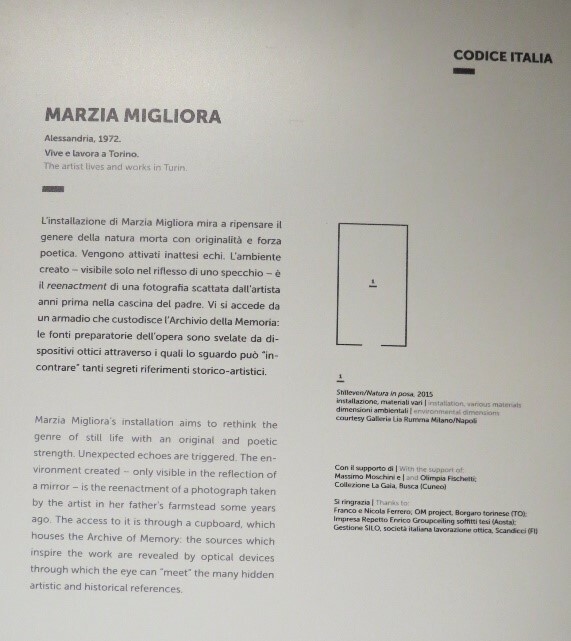 Interestingly I discovered that the works in the Biennale that had the best presentation in the catalog in terms of both image and text had a similar clarity in person. I decided to see the Japanese show because of the artist videos and prior images of the work. The Tuvalu pavilion was on my list because the description in the catalog piqued my interest. I visited the Austrian Pavilion for the architecture of the pavilion; the artwork was a pleasant surprise. The Italian pavilion was the only pavilion I had decided to visit for the combination of works presented in the catalog. Sean Scully was on my list to see but only if time permitted. I walked past the sign several times and finally walked in. I returned to the Sean Scully show several times. There were several other shows in Venice concurrent with the Biennale but unassociated with it. 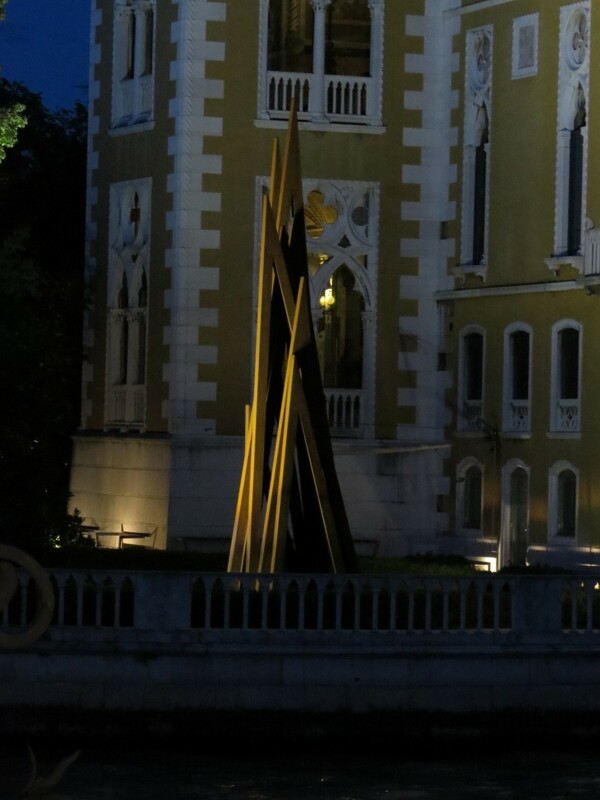 There was a beautiful Bernar Venet sculpture visible from the Academia. The Fortuny (http://fortuny.visitmuve.it/en/mostre-en/mostre-in-corso-en/proportio-exhibition/2015/03/8247/proportio-luca-pacioli-tribute/) hosted a show about proportions in art, which was stimulating although it tended to lose focus towards the end, due to there being just too much work mixed with the art of Fortuny. The Cini Foundation presented a small but interesting exhibition reuniting portraits of the Venetian Humanist, Daniele Barboro by Titian and Veronese along with some major architecture books, notably Vitruvius and Palladio’s books on architecture. (http://www.cini.it/en/events/portraits-of-daniele-barbaro-by-titian-and-veronese-at-the-palazzo-cini) This was a major discovery for me as I had scheduled a later visit to the Villa Maser (also called the Villa Barboro). The Villa Maser was designed by Palladio (who had illustrated Barboro’s translation of Vitruvius) and decorated by Veronese (http://www.villadimaser.it/en/sale-affrescate). I think the Cini should get the prize for the most effort put into the smallest exhibition. The presentation was impeccable and precise and the single sheet documentation (in English and Italian) was articulate and illuminating. Despite the lack of navigability and clear focus in the Biennale, it was well worth the visit. The best work was brilliant. A lot of the other was inane due to an excess of self-indulgent retrospection. The lack of navigability simply meant a reduction in the time available to discover the art work. I managed to see all of the desired works that I could find, but in the end just gave up trying to locate individual pieces. Three pieces that I wanted to see at the Arsenale were in an area called the Giardino delle Vergini. 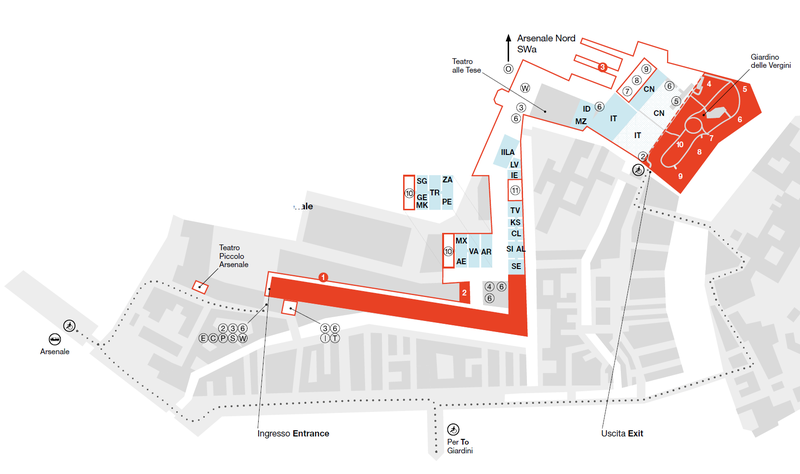 I could never find an entrance to this area except the one that was marked as the Biennale exit. When an exhibition boasts about the number of artists and countries represented (136 artists, 89 national pavilions and 44 collaborative events), it has a responsibility to ensure that access to what it highlights is provided. What I think staggered me the most about the organization of a Biennale that has been in operation for over 100 years (this is the 56th Biennale), was that there appeared to be fundamental issues of organization, e.g. free Wi-Fi sites with no indication of how to use the Wi-Fi. 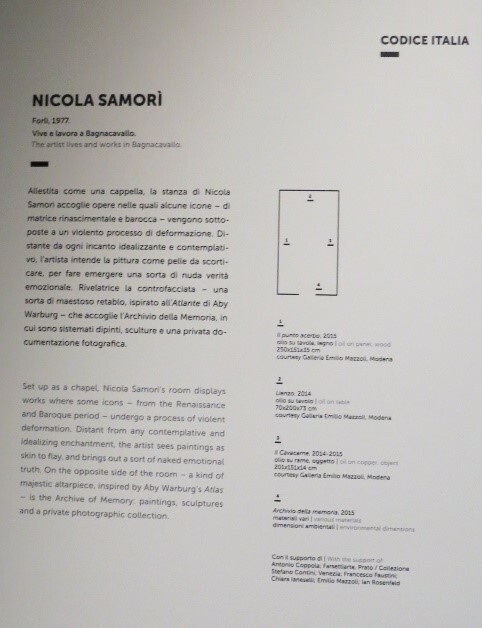 Even the ticket structure was complex, for example “Full price € 25 (valid for one entry to each venue, Giardini + Arsenale, may be used also on non-consecutive days)” or “Full Special 2days € 30 (pass valid for two consecutive days entry to both venues)”.